Runners and cyclists can take advantage of some neat GPS technology. It is now possible to create routes, replay training runs, make maps, and compare workouts. Software tools for activity tracking are getting better, and costs are coming down to the point where some good options are even free. 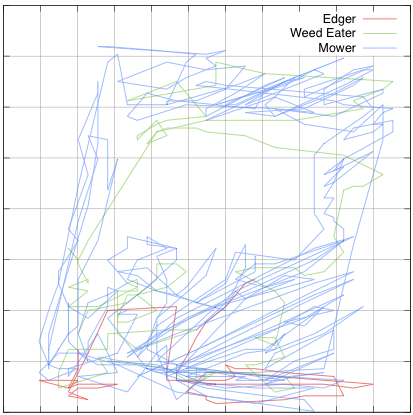 While GPS enables accurate position and speed measurements, elevation measurements are on the weak side because there is a relatively large amount of “noise” in the readings. Even small changes in elevation can be significant to runners and cyclists, especially if running over rolling hills. 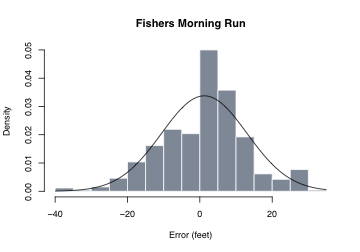 These smaller fluctuations can be at the limit of the GPS’s ability to accurately measure, and sometimes the smoothing algorithms obliterate all that extra work you did running up and down all those hills. So, more accurate elevation information could give a clearer picture about the effort required. 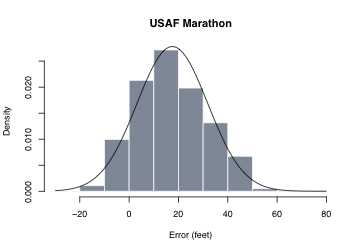 Some of the tools for working with GPS data from outdoor activities can apply corrections to altitude data. The corrected data usually comes from the National Elevation Dataset, much of which came from the Shuttle Radar Topology Mission. 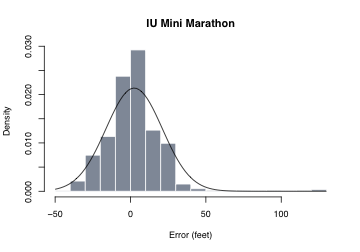 Out of curiosity, I compared elevation data from my GPS with elevation data from NED on three recent runs in different areas: a 6 mile run in Fishers, the USAF Marathon in Dayton, and the IU Mini in Bloomington. For the most part, they agreed to within a few feet, and the differences fit tidily into a normal distribution. To loosely summarize those graphs, my GPS tends to read around 7′ higher than the USGS altitude data. 95% of the time, they agree to within ±15′. The US Geological Survey claims that the NED data is accurate to within ±7–15 meters (23–49′). That’s about the same accuracy claimed by the GPS, so this is all probably a wash. It looks like it is not practical to get any better data for small elevation changes without adding a barometric pressure sensor to the GPS. Higher‐end cycling GPS units have these, but I am not aware of any running GPS units with barometric altitude sensors. 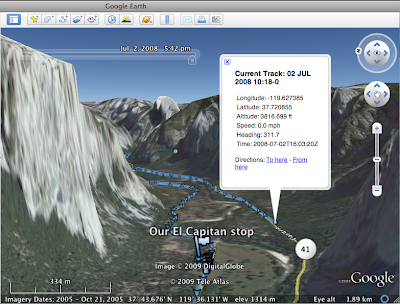 The free version of Google Earth 5.0 now imports GPS tracks from Garmin and Magellan units!